Southern senior Bailee Floyd (24) attempts a two-pointer over Miller’s Haille Joseph (33), during the Lady Tornadoes 65-37 loss on Thursday in Racine, Ohio. RACINE, Ohio — So much for second chances. 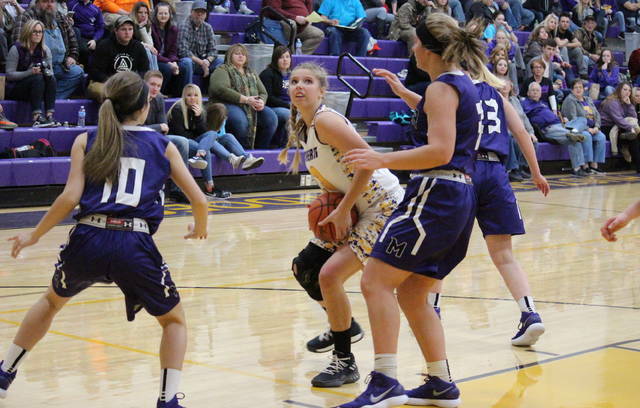 The Southern girls basketball team — which dropped an 11-point, 54-43 decision at Miller on Dec. 4 — fell victim to the Lady Falcons again on Thursday, as MHS claimed 65-37 victory in Meigs County. Miller (7-5, 5-4 TVC Hocking) scored the first seven points of the game and led 10-2 with 2:00 to go in the first quarter. Southern (2-10, 1-8) ended the first period with a 7-0 run, however, cutting its deficit to 10-9 by the conclusion of the stanza. SHS senior Josie Cundiff drained a three-pointer to open the second quarter, giving the Lady Tornadoes their first and only lead of the game, at 12-10, with 7:36 to go in the half. Miller regained the advantage on a three-pointer one minute later, and stretched their advantage to 23-16 at the 2:36 mark of the period. Over the remainder of the first half, MHS outscored the SHS by an 8-7 clip and headed into the break with a 31-23 lead. The Lady Tornadoes cut the deficit to six points within the opening 1:30 of the second half, but the Lady Falcons ended the period with a 20-to-2 run and a 52-28 lead. MHS pushed its lead as high as 34 points in the finale, but settled for 28-point, 65-37 win. 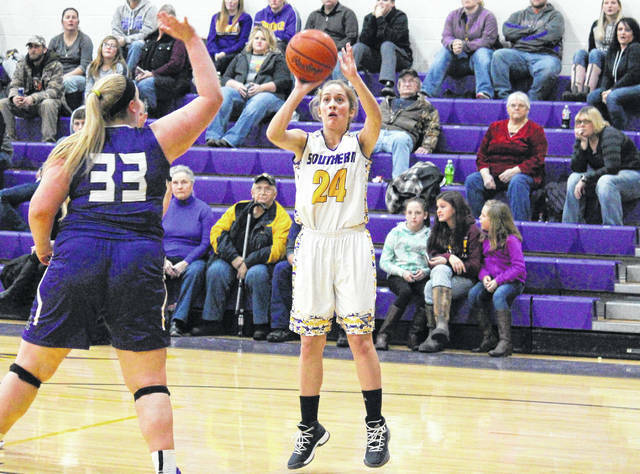 Miller attempted 32 more field goals than SHS in the game, with the Lady Falcons shooting 27-of-79 (34.2 percent) including 6-of-18 (33.3 percent) from three-point range, and the Lady Tornadoes shooting 12-of-47 (25.5 percent) including 3-of-14 (21.4 percent) from deep. From the free throw line, Southern was a near-perfect 10-of-11 (90.9 percent), while Miller was 5-of-17 (29.4 percent). The Lady Falcons won the rebounding battle by a 45-to-40 clip, including 24-to-13 on the offensive end. MHS also held advantages of 19-to-4 in assists and 19-to-5 in steals. Both teams rejected four shots in the contest. The hosts committed 30 turnovers in the setback, 17 more than Miller. 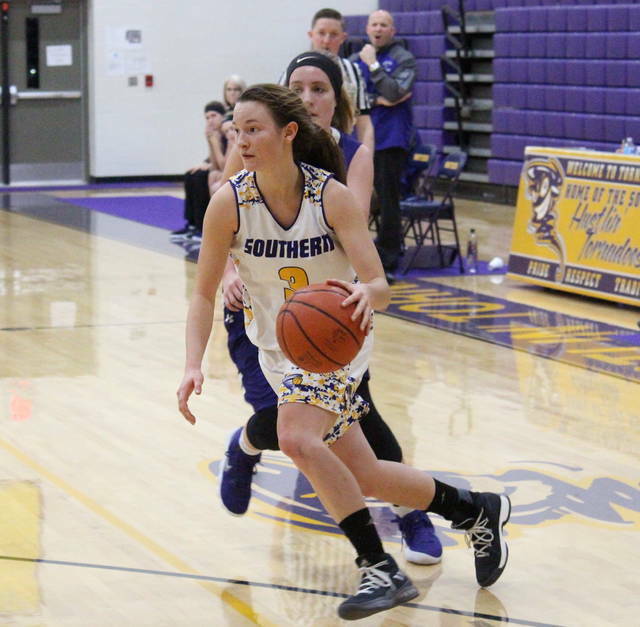 SHS sophomore Baylee Wolfe led the hosts with a double-double effort of 15 points and 10 rebounds. 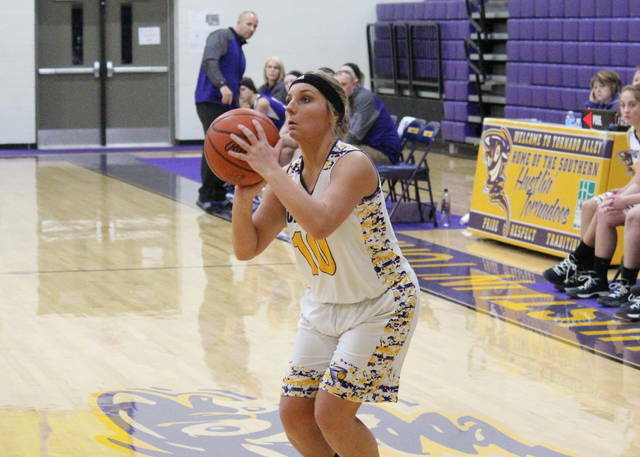 Josie Cundiff poured in eight points for the Purple and Gold, Phoenix Cleland and Lauren Lavender both added five, while Paige VanMeter and Shelbi Dailey chipped in with two each. Wolfe also led Southern on defense with three steals and one rejection. Recording one assist apiece for SHS were Wolfe, Cundiff, Jaiden Roberts and Shelby Cleland. Haille Joseph led the guests with 17 points, followed by Sophia Compston with 11 and Ashley Spencer with 10. Josie Crabtree and Chloe Rine both recorded eight points, with Crabtree earning game-highs of 15 rebounds and six assists. Brooklyn Wilson scored five points for the victors, Askya McFann added four, while Lacey Alexander marked two. Miller’s defense was led by Joseph with four steals and Crabtree with two blocks. After a non-conference bout with River Valley on Saturday, Southern will resume league play on Monday at Trimble.